Contrary to popular beliefs, Fresh Kills in New York City's Staten Island doesn't contain the biggest collection of garbage in the world. What Wikipedia says “could be regarded as the largest man-made structure on Earth, with the site's volume [...] exceeding the Great Wall of China” and was once the temporary dump site for the remains of the WTC Towers isn't the largest landfill at all. 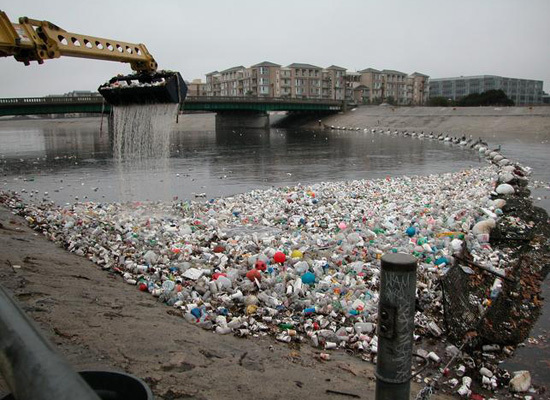 In fact, the largest landfill isn't even on land, but rather it is trapped in an oceanic riverine system known as the North Pacific Gyre. It is so vast, apparently, that these floating clouds have a total area equal to that of 2 Texas. Which directly leads me to wonder: can you collect these patches to create a floating solid ground? It'll be like a new Pacific island nation molded together out of “80,000 Nike sneakers and boots” and “tens of thousands of bathtub toys and hockey equipment” lost overboard from cargo ships. Or a recycled ocean cruisers from where eco-terrorists hunt down polluting holiday cruise ships in the high synthetic seas. Paradise Lost it may certainly be, but it may yet still be Arcadia Regained from the bottom of the ocean. 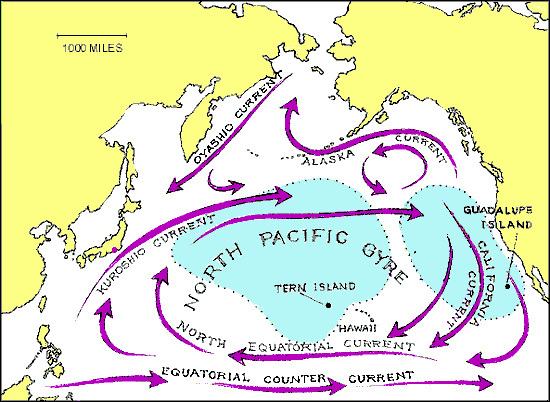 Of course, the islanders have the option of not anchoring this newly accumulated stratum of detritus to their former nation; they could submit it to the whims of the ocean currents and trade winds. And in their intraoceanic meanderings, they'll meet other climate change refugees on their own island nations made out of Barbie dolls. A new trade group could be formed, with the goal of developing self-sufficient economies and expanding their territorial boundaries by mining the Pacific for consumer goods Made in China. Is this the future site of the New Central Park of the Pacific, designed by Fresh Kills head designer James Corner? My dad is a volunteer for a couple of marine science organizations, and he has a list of people to whom he emails things of interest in marine science. I sent him this link, and it went out to his list. Thank you for the interesting and important post. This is the second or third time I have read about this. I have seen it on major news. But, like them, this site also lack photographs. Please present evidence. I don't know if I should believe this any more than I should believe an email story. I don't mean to be pessimistic or unfeeling, but it seems to me that if this gigantic vortex exists as described, photos should not be so hard to come by. How about the definition for the word diffuse, courtesy of Dictionary.com? This is amazing, I never thought that my garbage might be better traveled than I am. 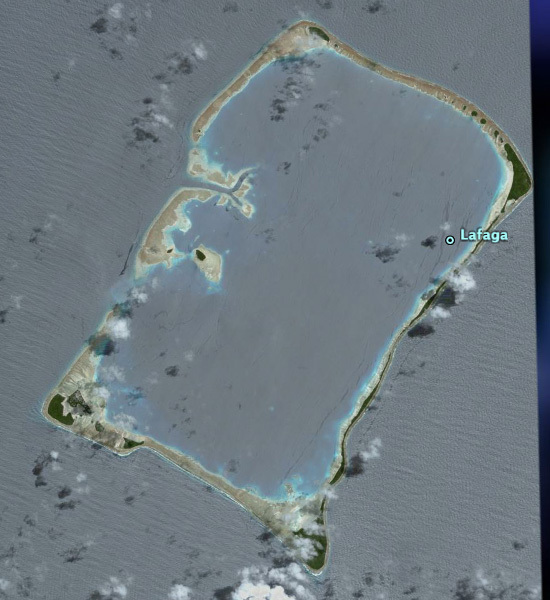 It's fun to speculate about future island nations on man-made land, but this can't be good for wildlife (or ultimately for us). Surely the whales and dolphins don't think this is funny. I feel shame that one day there will be strata of sedimentary rock composed of soda cans, goretex, and ikea furniture. But since it's in international waters will it just become another tragedy of the commons? 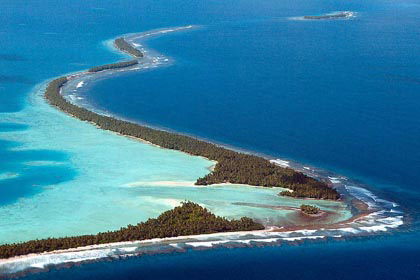 Who looks after the great Pacific?